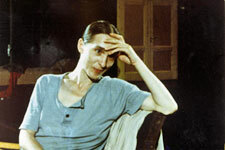 Bausch, who died in 2009, was one of the most significant figures of modern dance, and the pioneer of a unique style drawn from the German theatrical dance tradition known as tanztheater. Her striking dances and elaborate stagings explored personal memory and the relationships between men and women, among other things, through a mixture of movement, monologue and narrative elements that drew upon explosive, often painful emotions. Capturing the company's rehearsals and performances over a five-week European tour, Akerman takes us inside their process. She interviews members of the company, who Bausch chose not only for their talents, but for certain intangible personal qualities as well. 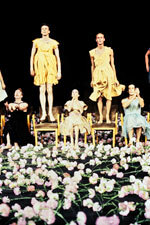 The dancers describe the development of various dances, and the way that Bausch calls upon them to supply autobiographical details around which the performances were frequently built. Akerman also shows us excerpts from performances of Bausch dances, including Komm Tanz Mit Mir (Come Dance with Me) (1977), Nelken (Carnations) (1982), Walzer (1982), and 1980 (1980), all recorded with Akerman's singular visual touch. "When I watched one of Pina's performances for the first time a couple of years ago, I was overcome by an emotion I can't quite define," Akerman says. ONE DAY PINA ASKED... is an attempt to define that emotion by traveling deep into Bausch's world.